The Korean Cultural Service NY (KCSNY) presents “Dance Beats of Korea,” a three-part dance showcase, each slotted for the evenings of Jan 30, Jan 31 and Feb 1 respectively at the KCSNY’s Gallery Korea. 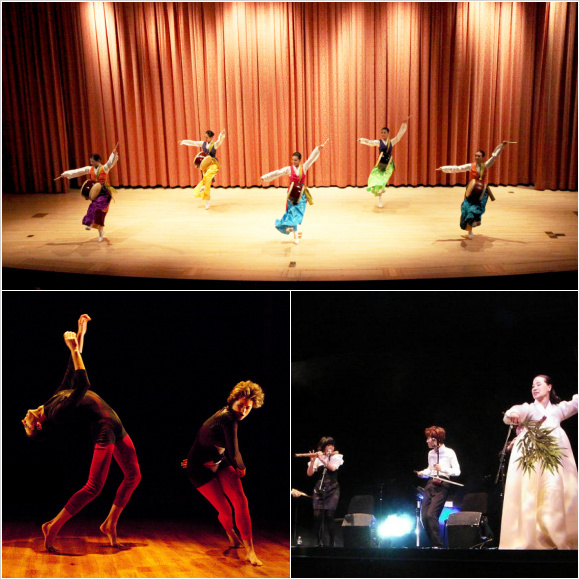 A fascinating combination of the soulfully traditional and the dynamically modern, “Dance Beats of Korea” marks the KCSNY’s first event of the year. “Dance Beats of Korea” constitutes Theme 3 of the KCSNY’s ambitious Open Stage series – a recruiting initiative designed to make a fresh, fair and rigorous selection among the plethora of talented performing artists seeking breakthrough in New York City. While offering the finest artists the much coveted chance to be showcased at the KCSNY, the Open Stage series will also help lend more diversity to the institution’s hosting record for performing arts. Yoo & Dancers, a New York-based modern dance company founded in 2009 by Ms. Hee Ra Yoo, will give a finely tuned performance titled “Glass Ceiling.” In it dancers interact with space and with one another in a manner that seems to defy the laws of physics; they roam and turn and vault as if the gravitational pull had gone all but topsy-turvy. The deftly composed and executed choreography reflects the anguish Ms. Yoo experienced as she struggled to navigate various social hurdles besetting her life as an immigrant and also as she grappled with more-personal woes and limitations. Ms. Yoo has danced with numerous dance corps including the Korean National Ballet, the California Ballet, the San Diego City Ballet, the Canberra Dance Theatre of Australia, the Kirov Ballet Company of Russia, and teaches at the Joffrey Ballet School, Dance New Amsterdam and Peridance. NARU, founded in 2007 in New York City and boasting some remarkably versatile and youthful performing artists, will present “Movement in Time,” a two-part dance and music galore skillfully juxtaposing the traditional and the contemporary. The first half will be devoted to folk dance routines such as jindobukchoom (dance with drum), janggobukchoom (dance with hourglass drum) and salpuri (shamanic dance), emphasizing the four defining elements of traditional Korean dance – namely, han (grief/resentment), heung (excitement/mirth), mut (taste/elegance) and tae (figure/carriage). The following second half will then leaven such traditional repertoire with a distinctively modern flavor, hence demonstrating the limitless adaptability and continued relevance of traditional Korean dance. The Song Hee Lee Dance Company helmed by the eponymous artistic director who made her solo debut at the Hudson Guild Theater in New York in 1997 will present “Tradition & Beyond.” It is a rich collaborative performance in which unique choreography that is equal measure folksy and modern, Korean and Western, is accompanied by ambient world music. An ensemble will play live and with no shortage of sound variety – from Korean string instruments gayageum and haegeum, to percussions, contrabass and electronic synthesizer. On this night the company will also premier its new work “The Four Walls” which will be an animated portrayal of the four seasons, four feelings (joy, anger, sorrow, pleasure) and four elements of nature (water, fire, air, earth). Further into this year, beginning March 14, the KCSNY will present the Open Stage 2012-2013’s next batch of performances, this time centering on the theater arts. Admissions to all the above concerts are free, but an RSVP is required. To reserve a seat, please visit the website of KCSNY at www.koreanculture.org. If you have any questions regarding “Dance Beats of Korea” please contact Hyo Han (212-759-9550 ext. 210), or email performingarts@koreanculture.org. No user commented in " OPEN STAGE 2012-2013: Dance Beats of Korea "